It’s almost tofu turkey time! One tradition in our home is tofu pumpkin pie. We’ve been making this delectable dessert for 16 years from organically homegrown, sugar pie pumpkins. It is always a crowd pleaser, even amongst our guests who usually shy away from bean curd, and of course, the kids love it! Nutritious and delicious, tofu pumpkin pie is the perfect ending to your Thanksgiving meal, even if you eat a bird. Of course, you can make tofu pumpkin pie from pumpkin in a can, but starting from the squash is more wholesome and fun. Cut an organic, small pumpkin in half (the sugar pie variety is best, but really any pumpkin will do). Lay the pumpkin halves face down on a cookie sheet. Next, poke holes in the skin of pumpkin with a fork, like you would to bake a potato. Bake the pumpkin for about 45 minutes, or until it is tender when poked with a fork. Cut into the dry mixture 1/3 cup of chilled butter. The trick to a flaky crust is to not let the butter warm, so if you need to use your fingers to crumble it, be careful not to let the butter absorb too much of your body heat. Add 2 to 3 tablespoons of cold water, then mix the dough until it just holds together: Do not over handle the dough if you want a flaky crust! Form the dough into a ball and chill it in the refrigerator for 20 minutes. In a crunch, you can place the dough in the freezer for 10 minutes. Next, roll the dough on a floured surface and place it into a buttered pie plate. Prebake the pie shell at 400 degrees for 10-15 minutes. Pouring dry beans into the pie shell will help it hold its shape while prebaking. Blend the mixture very well, then add it to the pie crust. You can substitute premixed Pumpkin pie spice, if you don’t have all these spices. It is also good to be cautious with the spices and flavor the pie to your taste. Add the filling to the prebaked pie shell. Bake at 375 degrees for 60-70 minutes. Adding tofu to desserts is a great way to give them more nutritional value and trick your friends and family into trying something new. Even my most conservative relatives (you know-the ones that voted for Bush), rave about my tofu pumpkin pie. Sometimes I wait until they have taken their first bite to reveal the secret tofu ingredient. This recipe is adapted from the Horn of the Moon cookbook and a 15-year-old flyer from Surata Soyfoods. I dunno how this will come out, but I am copying this recipe anyways. You said pumpkin and you said pie, thats all I gotta here. I’ll let you guys know if it turns out ok. If I die eating it – well, I wont be coming back to tell you guys, eh?. Krishna, I can’t wait for your wave review! I like to top it with fresh whipped cream, but if you want, I also have recipe for tofu whipped cream. This recipe sounds really good. I’m a bit of a freak but…do you take the seeds out of the pumpkin halves before you bake them? 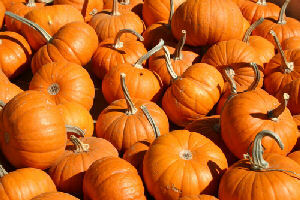 If you want to plant or roast the seeds, then yes, remove them before baking the pumpkin. Otherwise, just bake the pumpkin and scoop the seeds and pulp out after baking. It is much easier to scoop it out after baking, that’s why I do it that way. Blend until creamy (best done in a food processor). This recipe comes from Surata Soyfoods. I have only made it once, as I am a dairy junkie. Jennifer-how did you get the soy milk not to run in the recipe when it bakes? I subbed a soy milk once for a regular milk and it always ran or made it very soggy. Only oak milk did not run on me when baking. Have any suggestions for condensed sweet milk? Is there a way to add a “subscribe to comments” on your blog. WP has a plug-in but not sure how it works with wordpress mu. I’ve never had problems with soymilk when baking. I use it in everything from cookies to muffins. Although I am a dairy junkie, I can’t stand milk. I’ve had to milk too many cows with mastitis to drink the stuff. Anyways, if you bake the pie long enough, it will set up and be solid. The tofu helps to firm it up, and I have used both soft and firm tofu in this recipe. I usually use firm tofu. I am new to WP, so I am not sure how to subscribe to comments. Hi Jennifer-perhaps it is the tofu that helps like you said. Have any suggestions for modifying a dairy recipe with condensed sweeten milk? What is the recipe that requires the sweetened condensed milk? I have not used sweetened condensed milk much, but I would think that you could take some vanilla soymilk and cook it down to the consistency of sweetened condensed milk. There may be a product out there, but I don’t know. Really good and really interesting post. I expect (and other readers maybe :)) new useful posts from you! Good luck and successes in blogging!